High resolution CT Scan – HRCT is used to evaluate the lung parenchyma in patients with known or suspected to have a diffused lung diseases such as fibrosis and emphysema. Like the airway CT imaging. HRCT protocols use thin sections at 1.5mm or less, as fast acquisition to reduce motion artifact, and optimal spatial resolution. In addition to the thin sections, spatial resolution is optimized by the selection of an edge enhancing algorithm like the bone algorithm and a display field of view or DFOV that is just large enough to include the lungs. In some institutions, HRCT protocols are incremental, this means images are obtained with an interval of 10 mm or more between slices and only approximately 10 percent of the lung parenchyma is scanned. This technique is intended to provide representative areas of lung disease. However because evidence of some types of diffuse lung disease may not be uniform in distribution throughout the lung, this method of sampling may result in characteristic foci of the disease not being imaged. HRCT of the chest is used for the assessment of the lung parenchyma in patient with diffuse lung disease such as fibrosis and emphysema. Latest scanner like MDCT scanners have become commonplace, the technique known as volumetric HRCT is replacing the HRCT axial protocols. Volumetric HRCT protocols use a helical mode to acquire images of the entire lung, rather than representation slices. Because these helical protocols cover the entire lung, they result in a more complete assessment of the lung. Lung nodules that could be missed between slices in incremental protocols are not missed with volumetric HRCT, and the central airways can be evaluated at the same time. In addition, they allow postprocessing techniques such as maximum MIP and minimum minIP intensity projection reformation. 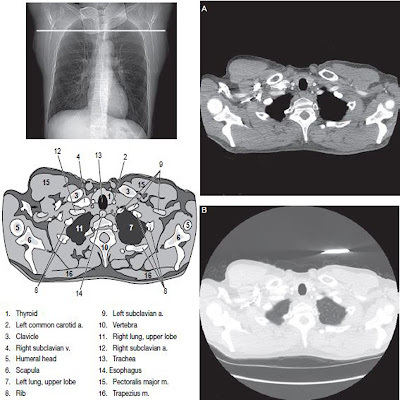 Although there are clear advantages to the us of volumetric HRCT over an interspaced technique, the increased radiation exposure is a consideration. Many volumetric HRCT protocols decrease the tube current mA and to reduce radiation dose. Some HRCT protocols are designed so that only a representative 10 percent of the lungs parenchyma is scanned. Other protocols, called volumetric HRCT, use a helical mode to acquire images of the entire lungs. Many HRCT protocols both for volumetric and axial include more than one series of scans. In all patients there is a gradual increase in attenuation and vessel size from anterior to posterior lung regions owing to the effect of gravity on blood flow and gas volume. In addition, there can be atelectasis in the most dependent lung like the side touching the CT table, that can mimic or hide lung disease. An additional series of prone images can help to differentiate actual disease from what is not. Expiratory scans are used to look for areas of the lungs that do not empty or get smaller, which indicates small airway disease. When the lungs are fully expanded the contrast between low attenuation aerated air space and high attenuation lung structure is maximized. Therefore, HRCT protocols are routinely obtained at full inspiration. However, expiratory images better depict bronchiolitis and air tapping. The density gradient from the effects of gravity is more pronounced on expiratory images. In volumetric protocols, only the inspiratory supine series is done in a helical mode. The addition images are done in the representative axial fashion to reduce the radiation exposure. For High resolution studies prone images can help to differentiate actual disease from densities owing to the effects of gravity the mimic disease.